Spring is an ideal time to up your personal self-care practices for cleansing, rejuvenation and your overall health and well-being. According to traditional Chinese Medicine, spring relates to your liver organ. Your liver allows for the smooth flow of energy (physically, mentally, emotionally, energetically and spiritually) throughout your body. Today I am going to show you how to dry skin brush paying particular attention to your liver meridians to promote the free flow of energy in your body. Start at the top of your big toe and make long strokes along the inside of your foot, along your inner leg, stroke up the center of your torso, add a little extra on the inside of your armpits at the front of your torso. Where to get a dry skin brush? Make sure you get a high-quality brush with natural and stiff bristles. You will also want a long handle so you can reach your back and hard to reach places. 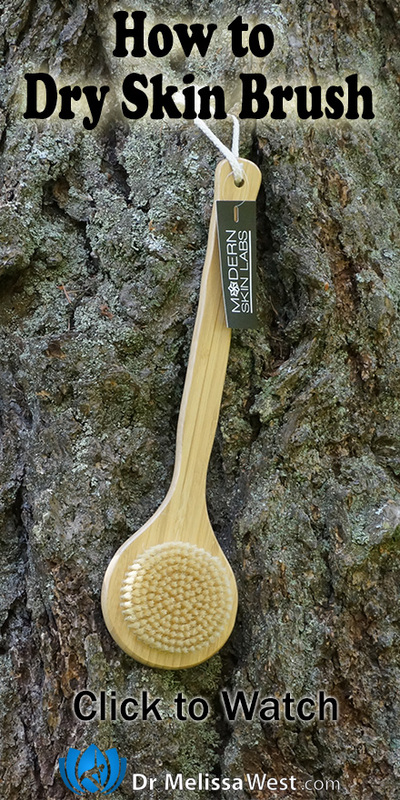 It has a soft bristle body brush with a strong bamboo handle. Its natural bristles exfoliate without scratching. The long handle makes it easy to reach your back and hard to reach areas and the bamboo is incredibly durable. 100% all natural, for you and the planet. The sling on the bottom makes it easy for you to hang in your bathroom. If you would like more support I highly recommend our yoga classes and blog posts for the liver. We have some free yoga classes and blog posts for the liver. Yoga Detox stimulates your body’s natural ability and intelligent capacity to cleanse itself from health threatening toxic substances. The practices in this video boost the body’s biological detoxification processes by stimulating the lymphatic system and digestive system as well as the liver, lungs, and kidneys. Yoga for the digestive system will improve elimination as well as move mucous up and out of the body. This video is designed to strengthen body’s systems of detoxification to cleanse accumulated waste. Yoga Detox will provide increased immune function, slowing of aging, increased energy and clarity of thought. I am also currently in the process of filming a new video for our membership community for the liver organ. It is a Traditional Chinese Medicine Pose that stimulates acupressure points for your liver organ. According to Traditional Chinese Medicine, the wood element is related to the liver and gallbladder organs. Your liver is responsible for the free flowing of energy throughout your body. When your liver energy or chi flows smoothly you will experience a smooth flow of physical and emotional energy throughout your body as well. Your liver also controls your tendons. When you incorporate yoga into your routine, it will contribute to maintaining healthy tendon health as well as your overall flexibility. Your liver meridian opens into your eyes, so stimulating healthy liver function will help to improve your vision as well.